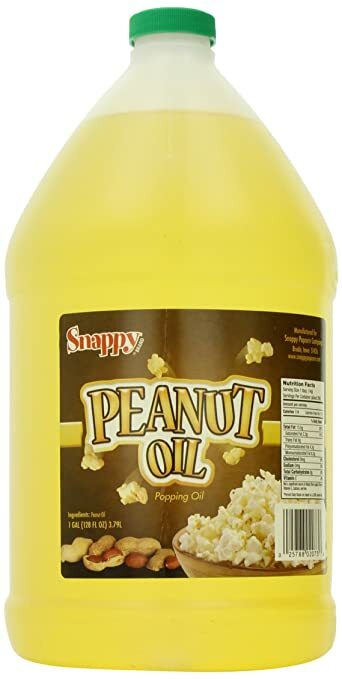 Best Oil For Popcorn | 2019 Reviews | Do NOT Buy Before Reading This! Without a bowl of popcorn, movie nights may seem incomplete. If you’re craving for that salty, buttery, and lip-smacking movie treat at the comfort of your home and don’t have the time to run to the movie theater, knowing just the best oil for popcorn making may just do the trick. While it may be tempting to grab a bag of microwavable popcorn, nothing quite beats the fresh taste and crispness of freshly-popped kernels, straight out of the pan. There is also more room for customizing and adjusting the flavor and how the popcorn is cooked. However, achieving a great-tasting bowl is not only dependent on the popcorn kernels but on the quality and kind of oil used as well. Here are some factors to consider choosing the right oil for your next popcorn-making session. Not oils are suitable for making popcorn as the kernels need to be cooked at a medium to medium-high temperature, thus requiring oils used to have a high smoke point. Smoke point refers to the temperature at which the oil begins to burn and smoke. Oil with a high smoke point has a higher heat tolerance and is more suitable for cooking. By using this, the popcorn kernels can be cooked more evenly and efficiently, while ensuring their crisp shells. Oppositely, using oil with a low smoke point can affect how the kernels pop and taste. Oils with low smoke points are more prone to burning when setting over high temperature. When used for popcorn making, this may cause the kernels to pop unevenly or burn, retain moisture and become chewy, or absorb the burnt taste of the oil. Moreover, subjecting oils with low smoke points to high heat for long periods is dangerous as it may cause the oils to release harmful and toxic substances. Whether oil is refined or not can also affect its smoke point. When oils are refined, there are lesser fatty and heat-sensitive components that can cause the oils to burn. Some of the oils with relatively high smoke points are canola oil, peanut oil, corn oil, avocado oil, and coconut oil. Another factor to consider is how the oil tastes like and if it retains or builds its taste as it is heated. I, for one, am not a fan of oils that retain their flavors as they can affect the seasoning that I will put on the popcorn. This is the reason why I prefer cooking popcorn with oils that have the least flavor or even tasteless such as canola oil and sunflower oil. Oils that can be used for making popcorn but have a distinct flavor are coconut oil, avocado oil (buttery), almond oil (nutty), or olive oil (grassy). This factor is relative, however, to a person’s taste. If you are one to enjoy the added flavor, oils with strong flavors can be used for cooking. If you prefer a cleaner popcorn taste to make seasonings stand out, you may opt for flavorless oils. Homemade popcorn is often preferred than the microwavable version for the added benefit of making the popcorn healthier. Popped in the right way, a study has shown that popcorn can be healthy and good for the body. The hulls of the kernels are rich in fiber and are good antioxidants. The use of nutrients-packed and healthful oil to cook the kernels can strengthen these benefits. While there are oils in the market branded as popcorn oils that can be used as alternatives (these are effective in cooking popcorn and impart that “theater snack” flavor and color as well), it remains helpful to check out cooking oils that are easily accessible and may be readily available at home. Here are a few oil options to try out. Canola oil and avocado oil are rich in Vitamin E and can help in nourishing the skin and repairing damaged skin cells. Both oils are also rich in antioxidants and can lower the risk of developing heart problems such as heart attack or stroke. Olive oil and peanut oil are also good options as they are packed with monounsaturated fats or good fats and can help in reducing low-density lipoprotein (LDL) cholesterol or bad cholesterol. Other oil options that can be considered are almond oil (good for lowering blood sugar), grape seed oil (rich in Vitamin E), and sunflower or safflower oil (good for the skin). Aside from their health benefits, these oils also have high smoke points, making them ideal for popcorn making. Considering all these three characteristics can help ensure that the popcorn can be cooked well, develop good flavor, and pack health benefits that can make it a great and healthy snack. Canola oil is considered as one of the healthiest oils to cook with as it has fatty acids and vitamins that help keep the heart in good condition as well as improve the skin. It is also one of the cooking oils that has no distinct taste that can affect the overall flavor of a dish and has a high smoking point that makes it an effective oil to be used for cooking. Made from certified kosher ingredients. Due to its high fat content, there have been cases of canola oil consumption causing indigestion. Avocados have been dubbed as one of the best power food and one of the healthiest fruits because of its high nutrient content. They contain lycopene, which makes it good for the health of the heart. This avocado oil follows suit in the health department as it is made up of 100% premium avocados and is handcrafted to achieve the best quality. Has no additives and preservatives. Easily solidifies when not in room temperature and easily goes rancid when stored improperly or stored for a long time. Olive oil is a staple in the Mediterranean region in cooking and preparing food. It has now become a part of most of the world’s households as well because of its rich flavor and health benefits. Do note that extra virgin olive oil and olive oil have their differences in terms of the way they were processed, thus affecting their carried nutrients or benefits. Extra virgin olive oil (or EVOO), such as Colavita’s, is a product after olives are processed into a paste and produce oil. No heat is involved in this process, hence the tag “cold-pressed.” Olive oil, as is, oppositely is a mix of premium extra virgin olive oil and reprocessed extra virgin olive oil that has not passed standards. This is refined until found suitable and is known to have less of the distinct olive oil flavor and color. Consumption of dishes with this oil or this oil alone can lower blood pressure and lessen the risk of developing heart diseases. Some consumers have found the taste of this oil too strong (almost bitter) for their liking. Peanut oil has a good balance of fatty acids that, with proper use, are beneficial to the body. It can also be processed in a variety of ways such as refined, cold-pressed, roasted, and unrefined. How it is processed can also affect its nutritional value. A good source of resveratrol, a component that helps lower blood pressure and improves the body’s immune system by stimulating the production of white blood cells. It may not carry the same natural nutrients and health benefits that a person may get from an unrefined or less processed peanut oil. Sunflower oil is a personal skincare favorite as it is rich in antioxidants that can help in the improvement of skin regeneration and condition. When not used in the kitchen, this can be applied on the skin to help in healing acne and lightening scars. When consumed, sunflower oil is also one of the healthy oils that can help in maintaining low blood pressure and giving the body energy. Freshly pressed from sunflower seeds and not genetically modified or processed. 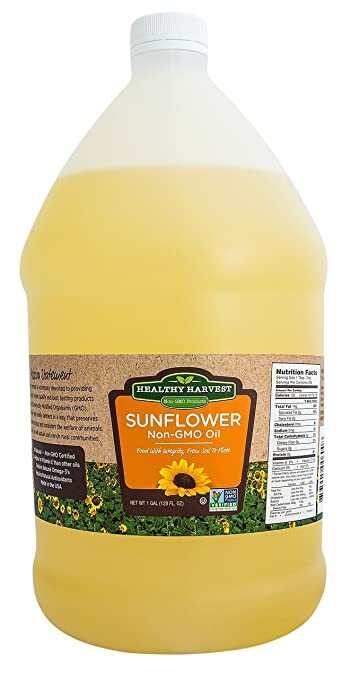 Sunflower oil, in general, carry different profiles of nutrient value, based on its origin or the kind of sunflower plant or seed from which it is processed.. Tip: Most cooking oils, such as vegetable oils and those aforementioned, are considered healthy as long as they are taken or consumed in moderation. Among all the possible options, Crisco Pure Canola Oil just may be the best oil for popcorn. As it has a high smoke point and can be used to adjust other oils or fat used for cooking, it can be a good, low-cost kitchen staple at home. It also imparts the most neutral oil taste that can make any bowl of popcorn a clean canvas for any chosen flavor profile or seasoning chosen. Its versatility in flavor and cooking performance also makes it a great option as it can be used for high temperature cooking as well as no-heat dishes. This vegetable oil is also beneficial to one’s health as it is packed with nutrients and antioxidants that aid in the development of a stronger heart and bones, immune system, and better skin. Considering all of these factors, canola oil may be the ideal oil to use to enhance, if not add to, the nutritional benefits of popcorn as well as achieve the crisp and clean taste of each popped kernel. In this article, we talked about the top 5 best oil for popcorn cooking. If you have questions about this topic, just drop them in the comment section below.